This time out, Aaron and Ryan are joined by newcomer Kevin Reitzel. Listen as Kevin gives his Joe history and lets us know where his G.I Joe love comes from. Then they discuss the beginning of a G.I. Joe era, issue 10. Title: "A Nice Little Town Like Ours..."
Then we look at the 3rd episode of The Revenge of Cobra, "The Palace of Doom". This episode first aired September 12, 1984 and was written by Ron Friedman. Join us next month for our next episode of G.I. Joe: A Real American Headcast, as we talk about G.I. 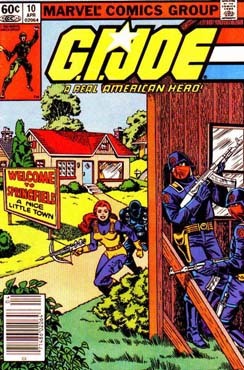 Joe: A Real American Hero, issue 11 and the fourth episode of The Revenge of Cobra!